Following the successful launch of Sticky Bandits video slot, Sweden-based game studio Quickspin has unveiled another new title in its portfolio. Titled Mayana, this fresh release will take you deep into the jungles of Central America, on a quest to find a legendary Mayan treasure. Developed in HTML5, Mayana brings top-notch visuals, as well as several lucrative bonuses. But that’s not all since the game also features the company’s Achievements Engine, designed to offer punters a more exciting and rewarding playing experience. Achievements Engine uses six game events to offer rewards in form of tokens, while the players can advance through levels and keep track of their progress. The game starts with a three-reel three-row layout and a total of 27 ways to win. The reels expand when winning combinations are made, which are formed when a minimum of three symbols are connected. Every time there’s a winning combination on the reels, a respin is awarded. This process is repeated with each new win. The grid can be expanded to a five-reel three-row layout, with 243 different ways of winning. 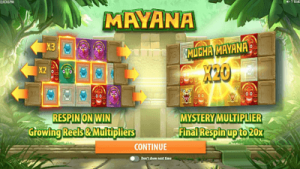 Once all reels are expanded, the players will have the chance to trigger the Mucha Mayana features, and increase their winning by up to 20 times! There’s also the Free Spins feature, which may fill your pockets with lots of money, especially since there are multipliers in play. Quickspin’s Chief Executive Officer, Daniel Lindberg, said he was confident this game would become very popular among the punters around the world. He added Mayana was an action-packed release, and full of fun and surprises. Lindberg promised there were glorious riches at hand and invited players to go on the hunt for the legendary Mayan Gold. The Stockholm-headquartered Quickspin was founded in 2011, and today offers an extensive portfolio of high-quality titles, while the list of the company’s most popular titles includes such hits as Dragon Shrine, Leprechaun Hills, Sakura Fortune, Hot Sync, Wins of Fortune and Phoenix Sun. In March 2016, Quickspin became a part of the Isle of Man-based gaming giant Playtech.